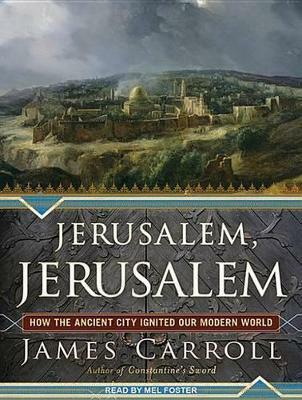 In James Carroll's provocative reading of the deep past, the Bible's brutality responded to the violence that threatened Jerusalem from the start. Centuries later, the mounting European fixation on a heavenly Jerusalem sparked both anti-Semitism and racist colonial contempt. The holy wars of the Knights Templar burned apocalyptic mayhem into the Western mind. Carroll's brilliant and original leap is to show how, as Christopher Columbus carried his own Jerusalem-centric worldview to the West, America too was powerfully shaped by the dream of the City on a Hill-from Governor Winthrop to Abraham Lincoln to Woodrow Wilson to Ronald Reagan. The nuclear brinksmanship of the 1973 Yom Kippur War helps prove his point: religion and violence fuel each other, with Jerusalem the ground zero of the heat. James Carroll is a columnist for the "Boston Globe" and a regular contributor to the Daily Beast. A bestselling author, his many publications include "Crusade," "House of War," "Secret Father," and "An American Requiem," which won the National Book Award. Mel Foster has narrated over 150 audiobooks and has won several awards. Twice an Audie finalist for "1864: Lincoln at the Gates of History" by Charles Bracelen Flood and "Finding God in Unexpected Places" by Philip Yancey, he won for the latter title.